INDIAN WELLS, Calif.—Juan Martin del Potro is a teddy bear with a heavy brow and a shotgun forehand, and when he gets mad in public, apparently, he hugs whoever happens to be around. Because he is a professional tennis player that person is usually a line judge. That’s what he did in a fit of rage three years ago, and it’s what he did last night, halfway through the third set against Novak Djokovic. This is an adorable coping mechanism, but it didn’t bode well for the big Argentinian’s mental state. He was in a funk and with good reason. He’d been broken, and at that point he knew there was no way to wrest back this unfairly tough third-round match from Novak Djokovic, who won 7-5, 3-6, 6-1. Already this is the second time this year that the Serbian played the speed bump in del Potro’s crowd-pleasing comeback tour. After the match, Djokovic told reporters that he’d been playing his best tennis of the year. And he looked it: Abusing del Potro’s atrophied backhand, counterpunching the pace on his forehand, uncharacteristically venturing to net for some slick volleys. “I’m not a natural volleyer,” he confessed to us afterwards, but his recent increase in doubles play may have softened up that touch. He’ll need those tricks and any others available to beat Nick Kyrgios, his next opponent, who looked hard to defeat in his breezy, slightly anticlimactic 6-3, 6-4 win over future star Alexander Zverev. What most people consider a weakness, this loose approach he has to the game, it’s also in certain departments a strength, because to come up with the shots he does is only possible if you approach your game as loose as he does. There’s something to be said for this, this coolness of mind amid the heat of the point. And worst-case scenario, it does nothing for your game but still inevitably pisses off your opponent, as it seemingly did Djokovic the last time they played. You have to assume he’s very eager to avenge that loss to Nick this afternoon. 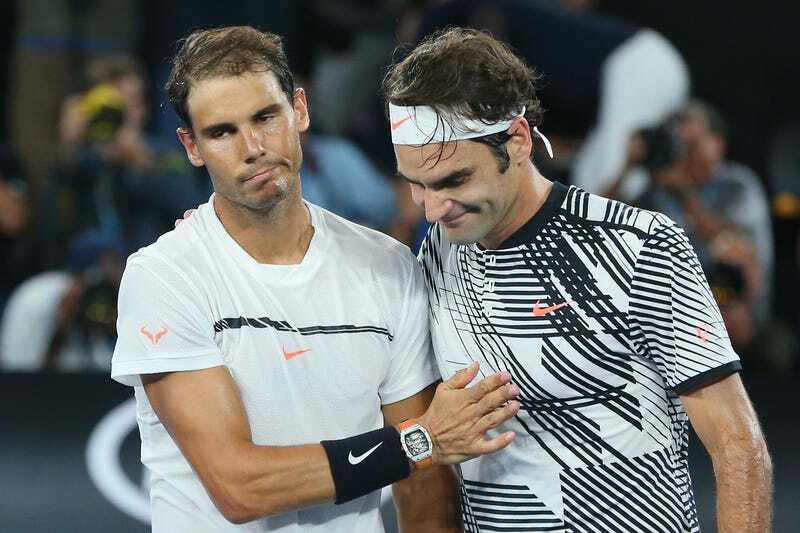 Whoever wins that match will then play the winner of a very good one: Roger Federer versus Rafael Nadal, reprising their Australian Open final (and the other 34 times the two GOATs have crossed paths). Federer had to work a bit harder to get to this round, surviving hard-serving American Steve Johnson 7-6, 7-6. Meanwhile Nadal had to beat his fellow lefty Spaniard, Fernando Verdasco, 7-5, 6-4. Verdasco always has the sauce to beat the best, but he does not always have the head, and yesterday was spent missing and sulking, with the occasional monstrous winner mixed in. Nadal got the win despite looking unfocused and awfully shallow on the forehand side. Surely he’ll lock all the way in once he sees his old friend across the net. I’d be reasonably surprised if whoever won this Quarter of Death didn’t end up winning the whole tournament, but who knows? Over on the other side, Kei Nishikori is still looking spry. He’ll be well rested after squashing Gilles Muller 6-2, 6-2 yesterday, and will likely remain well rested since he only has to skate by Donald Young today. It’s almost cruel how arduous a path some top seeds face, while others glide through the bracket, but randomized draws are funny that way.